Sign up and receive Property Email Alerts of Penthouses for sale in Ballito Central, Ballito. An extraordinary residence inviting the distinguished buyer. Exclusively and proudly offering a unique property and a rare opportunity for the select few, the home of the late business tycoon, politician and one time legendary rugby administrator, Dr. Louis Luyt. Elegant and majestically positioned Penthouse in the prestigious Ballito Manor with grand proportions, tasteful finishes and easy living flow. This unique and exclusive residence measuring 661 m2 offers open flow living areas leading to an unrivalled private balcony with 180 degree sea views, stretching as far as the eye can see. Sophisticated living is enjoyed within the large reception areas, consisting of lounges and dining rooms, built in bar and glass doors which flow seamlessly. A massive story book master bedroom complete with lounge, conservatory, large walk in dressing room, his and her en suite bathrooms and own private balcony. Grandeur and elegance compliments all 4 en suite bathrooms and guest cloak room. A gourmet kitchen fitted with Miele Appliances, and Samsung double door fridge, including cooler, Microwave, tumble drier, washing machine, dishwasher, warmer drawer, wine cooler, gas top stove and 2 ovens. Separate scullery. A private fully fitted built in study with extensive Southerly facing sea views. This masterpiece also offers, climate control, underfloor heating, light dimmers, heated towel rails, electric curtains, close circuit TV, Fibre Access, Exclusive Satellite Dish, back up complex Generator, inverter for selected appliances, as well as exclusive Staff cloak room on separate floor. Double garage with automated doors and 6 allocated basement parking bays adjacent to lift with exclusive access to Penthouse. Originally a gracious North Coast home built in the early 1980's, this was one of a handful of remaining sites along the prime Ballito coastline. In 2005 the 10 000 m2 property was developed into 80 upmarket sectional title units, boasting all the convenience and security of modern apartment living with a relaxed coastal lifestyle. Ballito Manor has landscaped gardens, a beautiful fenced swimming pool with shower and toilet facilities as well as a communal braai area. Positioned perfectly for all the leisure and lifestyle activities the North Coast has to offer and close to 7 International Golf Courses, Ballito Junction and Lifestyle Centre, Schools and Hospitals. 15 mins from King Shaka International Airport and Sibaya Casino. 25 mins from Umhlanga Ridge and Gateway Shopping Centre. An true rare and unique opportunity never to be repeated again. 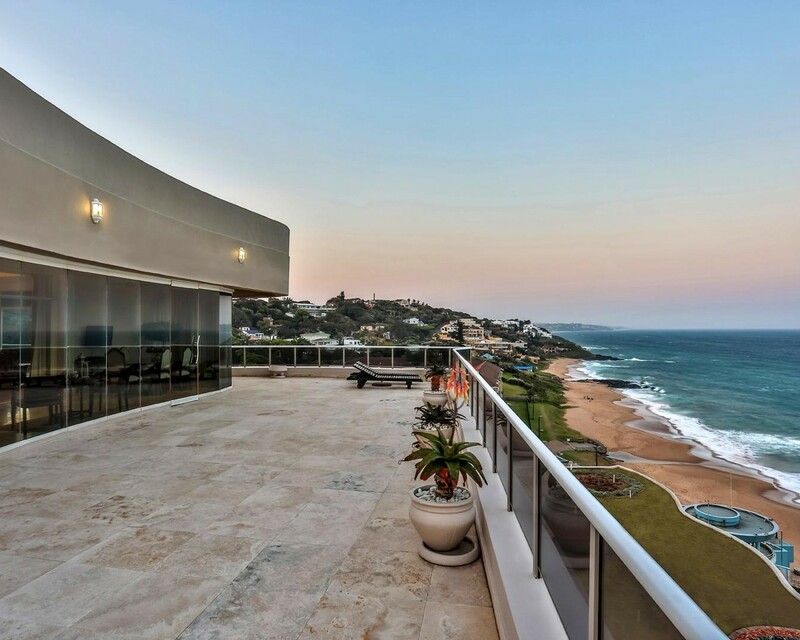 Sign-up and receive Property Email Alerts of Penthouses for sale in Ballito Central, Ballito.